INK studio is pleased to present He Yunchang's solo exhibition Water Forming Stone, which includes a brand-new series of three performances and a selection of his past works. Trained as an oil painter, He Yunchang (b. 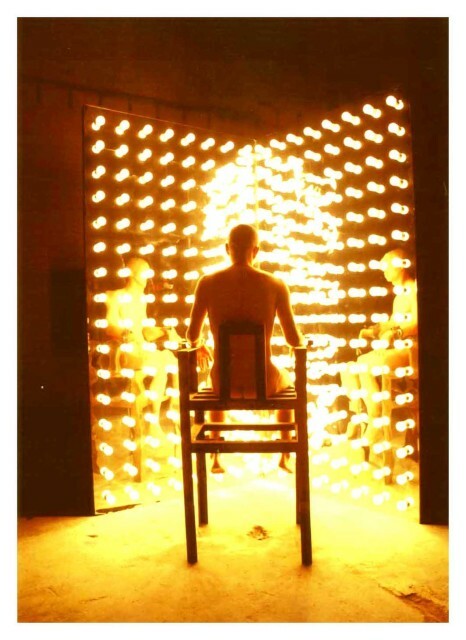 1967 in Lianghe, Yunnan) turned towards performance art in the early 1990's and has become one of its most committed and challenging practitioners. By treating his own body as both medium and object, he turns abstract philosophical concepts and the amorphous transformations of our times into experiences that are concretely comprehensible and lived. Indeed, he refers to his practice in Chinese as xianchang yishu or "live art" in distinction to the sense of "performance" as acting. Testing the extremes of psychological and physical endurance, his works achieve a poetic and cathartic intimacy that reverberates through and beyond their visceral impact. Water Forming Stone marks a critical transition in He Yunchang's career: in his own words, an expansive opening after summiting a peak and a tranquility after a mortal confrontation. Unfolding as a narrative, the tripartite performance series also evokes the formation and evolution of life, nature, and society. It engages ink, water, and paper—the essential elements of the classical ink tradition—as well as the artist’s own interpretations of the philosophical dialectics between solid and void, yielding and unyielding, active and inactive, pure and impure, past and present. Curated by Nataline Colonnello, INK studio Gallery Director, the exhibition surveys documentation and material artifacts of He Yunchang's past works, including Dialogue with Water (1999), in which he attempted over 90 minutes to cut a river into two halves with a knife while hanging upside-down from a crane; The Rock Tours Around Great Britain (2006-2007), in which he carried a rock from the northeastern coast of England and returned it there after walking 3,500 kilometers counterclockwise along the perimeter of Britain; One Rib (2008), in which he had his eighth rib—one of the longest and most vital—surgically removed and made into a necklace, and then posed for photographs with the five most important women in his life wearing it; and Eyesight Test (2003), in which he stared at close distance at 10,000 watts of light for an hour. Born and raised in western Yunnan near the Myanmar border, He Yunchang graduated from the oil painting department of the Yunnan Arts University in 1991. He has held solo exhibitions at such major venues as the National Gallery of Belgium (2013) and Indonesia National Museum (2008). He has participated in group exhibitions at the Yokohama Triennale (2014); China Pavilion, the 55th Venice Biennale (2013); Fukuoka Triennale (2009); Performa (2007); Sharjah International Art Biennial (2003); and Busan Biennale (2002); as well as Groninger Museum, Gwanju Museum of Art, Seoul Museum of Art, and National Museum of China, among many others. He is the recipient of International Exchange Award of the Macao Museum of Art (2006) and the First Yan Wenliang Art Award (2011). His works may be found in the collections, among others, of the National Art Museum of China, Beijing, China; Fukuoka Asian Art Museum, Fukuoka, Japan; Queensland Art Gallery, Brisbane, Australia; Centre Georges Pompidou, Paris, France; White Rabbit Gallery, Sydney, Australia; Macao Museum of Art, Macao, China; and in the private collections of Uli Sigg and Jin Hongwei.